Teleworking. Virtually commuting. Telecommuting. Virtually everyone is doing it. According to Global Workplace Analytics, 50% of the US workforce is at least compatible with virtual work. The benefits to employers are clear. 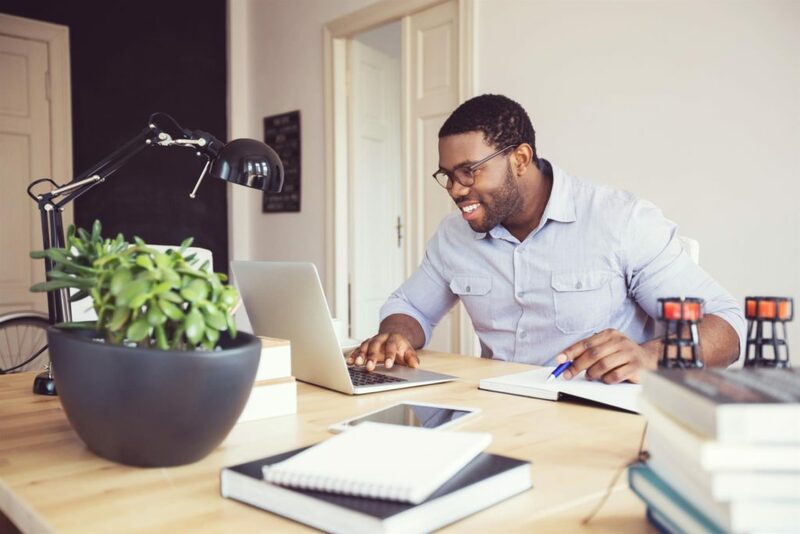 According to Forbes, more than 65% of managers report that virtual work increases productivity, lowers staff turnover, and saves organizations up to $11,000 per employee in reduced costs. Telework is good for our planet, as it reduces network congestion and air pollution, and workers benefit from greater flexibility and wider career options (no longer limited by location), not to mention saved time. (The average US work commute is 26 minutes each way, which adds up to a full 9 days a year!) So, how can we, as employees, do our part to ensure virtual work is both satisfying and successful? A fast, reliable internet connection is key to all virtual work. Secure a good connection, and always check your technology before you get started. Test your mic, webcam, and any other hardware you might need. Confirm all your hyperlinks, programs, and apps are working. If (realistically, when) you hit a snag, STAY CALM. Breathe. If you don’t find a quick fix in your organization’s tech guide, call or message your tech support person. A straightforward tech guide or point person will help you keep the show on the road. Remember—Keep. Breathing. Also, remind yourself to test the technology well before the meeting next time. A virtual team does not have to be a disconnected team. Research has identified 20 emerging best practices employers can use to manage the potential downside of missed in-person social engagement. Regardless of the company’s efforts to help teams get to know each other, it’s on us, as employees, to effectively engage. How? Listen actively and speak up. Wait for others to finish before replying. Pause after comments to allow others to give feedback. In larger meetings, share your name when you comment (e.g., “Cynthia here…”). Even dare to share something personal about yourself. Whether telework is a one-off gig or your daily bread, these small practices will help you connect person-to-person with your virtual teammates. Research by the American Psychological Association shows that task switching can decrease our productivity by up to 40%. Noise, too, affects our performance and can contribute to both acute and chronic stress. Look for ways to minimize noise and distractions in your virtual work environment so you can focus on the task at hand. Close programs you’re not actively using. Temporarily disable pop-ups and notifications, and ditch the jingling, beeping accessories that create extra noise. If not needed for the current call or meeting, silence your cell phone or use the “Do Not Disturb” feature. And remember: the mute button is your friend. Nobody wants to hear ringing doorbells and barking dogs in the middle of an important discussion. When possible, use silent, visual cues to share your feelings and opinions during virtual meetings. Leverage body language when using your webcam or try the “star” and “thumbs-up” buttons if available on your virtual platform. When you do speak, your voice will carry more weight. Eliminating distractions and embracing a little silence will create a more productive, less stressful virtual work experience. In the Team Connective Tissue blog post, Jennifer shared a key to Versado’s organizational approach—nurturing the “connective tissue” that keeps our company culture thriving even when the nature of our work prohibits us from being in the same place at the same time. When we meet virtually, we seek to engage all learning styles through various formats and activity types, including facilitator-led discussions, interactive polls, planning exercises, and role plays. Good virtual experiences are interactive and fun. However, interactivity and fun are two-way streets. It’s up to us, as participants, to dig in and get involved. Raise your virtual hand. ‘Like’ that video. Crush that quiz. Look alive and don’t be afraid to have a good time. Interact with energy and enthusiasm and watch your virtual work thrive. Virtually everyone is doing it. According to Global Workplace Analytics, 50% of the US workforce is at least compatible with virtual work. The benefits to employers are clear. Forbes recently stated that more than 65% of managers report that virtual work increases productivity, lowers staff turnover, and saves organizations up to $11,000 per employee in reduced costs. It’s even good for our planet, as telework reduces network congestion and air pollution. So that’s the employer. How do we as employees do our part? A fast, reliable internet connection is key to all virtual work. Secure a good connection first. Also, remember to test your technology ahead of time. Test run your mic, webcam, and any other hardware you’re using. Take a run through all your hyperlinks, programs, and apps. If—and realistically, when—you hit a snag, STAY CALM. Breathe. Remind yourself to try the technology well before the meeting next time. If you don’t find a quick fix in your organization’s tech guide, call or message your tech support person. A straightforward tech guide or point person will best help you keep the show on the road—and help the rest of your teammates in the process. To manage the potential downside of missed social engagement, research has identified 20 emerging best practices employers can use to help employees learn about each others’ character and expertise. After that, it’s on us as employees to effectively engage. How? Listen actively and speak up. Wait for others to finish before replying. Pause after comments to allow others to give feedback. In larger meetings, share your name when you comment (e.g., “[blog author’s name] here…”). Even dare to share something personal about yourself. Whether telework is a one-off gig for you, or your daily bread, these small practices help you connect as a whole person to your virtual teammates. American Psychological Association research shows that task switching decreases our productivity by up to 40%. Quieting the din helps us to zone in—more fully engaging and connecting. Silence also allows us to be fully present, to listen, and to resonate with others more effectively. Virtual technology provides a host of tools to create focus and allow a little quiet. Use [silent] visual cues to share your feelings and opinions. For example, use body language if video sharing, or try out the “star” and “thumbs-up” buttons if they’re available on your virtual platforms. But ditch the jingling accessories. Close programs you’re not actively using. Temporarily disable popups and notifications. If you’re not using your cell for the current call or meeting, silence it. The mute button is your friend—nobody wants to hear your AmazonPrime Delivery arrive, your dog bark at the delivery person, or your chinchilla squeak with delight. So focus and embrace the silence—your voice will carry more weight when you do speak. In the Team Connective Tissue blog post, Jennifer shared a key to Versado’s organization—balancing the ownership and flexibility of the work with the practical side of what needs to get done. Versado seeks to engage all learning styles, using various formats and activity types including facilitator-led discussions, interactive polls, planning exercises, and role play. Good virtual experiences can be summed up in two words—interactive and fun. The question then becomes—will we as participants dig in and get involved? Raise your “virtual hand.” “Like” that Video. Crush that quiz. Look alive, and watch your work come alive as you interact virtually with confidence, professionalism, and ease.